Which iPad Case Keyboard Is Best For You? Do You Need an iPad Air Keyboard? With the availability of Microsoft Office for iPad, the Apple iPad has become a laptop replacement for a growing number of people. So, which iPad Case Keyboard is best for you? Do I Need A Case With Keyboard For My iPad? Although you don't need a keyboard for your iPad, for a serious typing session, an external keyboard is a distinct advantage. It gives you the advantage of having real keys without losing the iPad’s portability and touchscreen. Or, if you just can’t get used to the iPad’s onscreen keyboard, or you find it takes up too much screen space, then you could benefit from an external keyboard. You could use a regular Bluetooth keyboard with your iPad. However, a combination case offers better practical use, with the added advantage of protecting your iPad when not in use. Most include rechargeable batteries that last for weeks, or months, on a single charge. If you own the iPad Pro, then some cases with keyboards are designed specifically for the iPad Pro by using the smart connector. In this case, no Bluetooth is required. The connector deals with charging and data exchange directly. If you frequently need a physical keyboard when using your iPad, you will love the convenience of a keyboard built into a case. You always carry the keyboard with your iPad. If your need for an external keyboard is infrequent, you may find a folio or clam style case with keyboard can be a bit bulky. It can also be a hassle to remove. Shell style keyboards are a good compromise. They are easy to remove when not in use, and are comparable to a stand-alone keyboard. This is by far the most common type of case. The keyboard is integrated into a case that wraps around your iPad and protects it all over. The folio design is the most convenient to use on your lap. No desk or table is required. These models, as well as the clamshell model usually have the thinnest keyboards. This type of case turns your iPad into a laptop. The iPad becomes the screen and the keyboard enclosure attaches by a hinge to form the laptop base. Most clamshell cases tend to add weight and bulk. However, the keyboard keys tend to be better than the folio case model. This type of case is the thinnest and lightest of all the cases. It integrates a thin keyboard into a rigid shell that protects the screen of the iPad; similar to Apple’s Smart Cover. Keyboard shells can be used on your lap if you’re careful, but they’re usually less stable on your lap than folios and clamshells. Some keyboard shells, but not all, can be used in tandem with Apple’s Smart Cover. As with the clamshell design, these designs are usually a bit cramped, and the keys are usually smaller than normal. The iPad supports almost any Bluetooth keyboard. Some of the best are specifically designed for use with the iPad. These are more suitable because of their portability, and they usually include iOS specific special function keys. The function keys can be used to adjust volume and screen brightness, control media playback etc. There are also some that provide dedicated cut, copy, and paste buttons. You should also be aware that that none of these external keyboards support trackpads. Unfortunately this is because Apple iOS still doesn't allow for it. How Do You Choose The Right one? No matter what your requirements are, I’m sure you will be able to find an option to suit you. Is an Apple iPad Case with Keyboard right for you? And how do you pick the best model for your needs and budget? 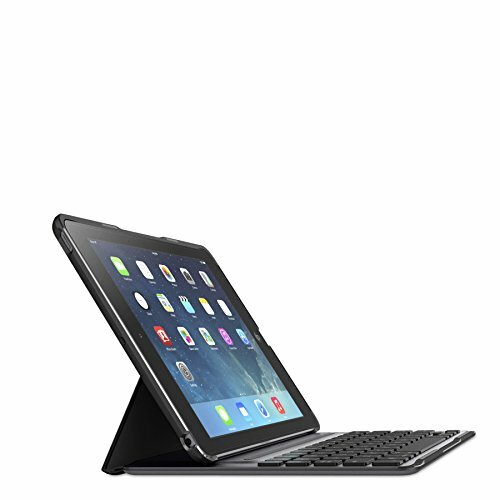 Our iPad Case with Keyboard buying guides have the answers to these and other questions. Hi there, my name is Stuart and I love all things related to the Apple iPad and especially the Mini iPad. I bought my first Mini iPad when I was doing a lot of traveling. I wanted to be even more productive so my ideal solution was to invest an iPad Case with a Keyboard. BestiPadCaseKeyboards.com is a participant in the Amazon Services LLC Associates Program, an affiliate advertising program designed to provide a means for website owners to earn advertising fees by advertising and linking to amazon.com and any other website that may be affiliated with Amazon Service LLC Associates Program. © 2017 Best iPad Case Keyboards. All Rights Reserved.